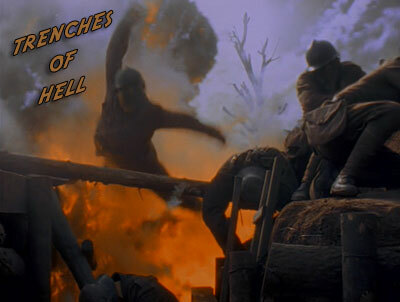 Poison gas and prison camps bring home the true horror of war to Indiana Jones in this powerful, dramatic film. As a young soldier in the Belgian Army, Indy learns firsthand the savagery of warfare while participating in the Battle of the Somme. Almost succumbing to despair as his life becomes an endless round of artillery barrages, nerve gas attacks and decaying corpses, Indy fears that death will be his only way out. Then he is captured by the Germans and confined to a POW camp where he and fellow prisoner Charles de Gaulle hatch a daring scheme to win their freedom in true "Great Escape" style. 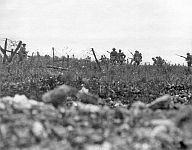 Often remembered as one of the most tragic and pointless battles of WWI, the Battle of the Somme ended with over 1 million casualties and an allied territory gain of approximately seven miles. However, the tragedy of the battle and the great losses spark interest to this day. Brown, Malcolm. The Imperial War Museum Book of the Somme. London: Pan Books, 2002. Laffin, John. The Western Front Illustrated: 1914-1918. Gloucestershire:Sutton Publishing Ltd., 2001. Sheffield, Gary. The Somme. London:Cassell, 2004. British poet and activist who served in WWI. Nicknamed "Mad Jack" by his comrades on the front for his "manic" and brave actions, Sassoon remains one of the quintessential war poets. After losing a close friend in the war, Sassoon turned his writing talents to anti-war prose and poetry. Sassoon's writings endure to this day and have timeless meaning for war veterans of any generation. Barker, Pat. Regeneration. New york: Penguin Group, 1993. Sassoon, Siegfried. Collected Poems 1908-1956. London: Faber and Faber, 1947. British poet, novelist, and critic who served in WWI. Perhaps best known for his World War I memoir Good-bye to All That and the historical novel I, Claudius, Graves is remembered as one of the best writers to emerge from WWI. Graves, Robert. Goodbye to All That. New York: Anchor Books, 1957. Seymour, Miranda. Robert Graves: Life on the Edge. New York: Henry Holt and Company, 1995. Remembered for his love and dedication to "his" France, the controversial and revered Charles de Gaulle began his well-known career as a French soldier during WWI. He later declared himself leader of Free France throughout the Nazi occupation of France in WWII. Following WWII, De Gaulle emerged as a hero and later became the President of France. Cook, Don. Charles De Gaulle: A Biography. New York: The Putnam Publishing Group, 1983. Jackson, Julian. De Gaulle. London: Haus Publishing Limited, 2003. Below you will find information about each documentary that supplements Trenches of Hell. Begun in July of 1916, the devastating Battle of the Somme was a turning point in warfare, demarking the modern combat arena in horrific carnage. Unseasoned and poorly trained British soldiers vastly overestimated the tenacity of German forces. Despite a solid week of bombardment where over a million artillery shells rained down upon German fortifications, they stood ready for the British advance. More British soldiers died on the first day of the Battle of the Somme than any other day in the history of British warfare. As the battle slogged on, troops effectively fought within an open graveyard, as there was no time to bury the multitude of the dead. As attrition wound down the 141-day conflict, almost 420,000 British soldiers lay dead, along with 200,000 French, and nearly half-a-million Germans, and all for a questionable purpose. Produced and Written by Adam Sternberg. He was a soldier's soldier, decorated for bravery by the British government and respected by the men in his battalion. But war had taken its toll on Siegfried Sassoon, and he felt a deep resentment against his country's military campaign. Sassoon returned from the trenches of hell in World War I to fight another battle in the halls of government back home. His resentment took the form of poetry: searing indictments that ran counter to popular opinion. This is the story of how one man's poetry and his protest against World War I shined a light of truth on the subject of war forever framed that conflict in the memory of his country. Produced and Written by David O'Dell. Writer Robert Graves took many unpredictable turns on his fascinating journey through life. Though Graves would describe himself first and foremost as a poet, he was a man of enormous literary talent who wrote more than 150 books. He was eccentric, brilliant, and visionary and his vivid imagination was fueled by a volatile mixture of emotional highs and catastrophic lows. His most memorable works emerged when the world around him was falling apart. At the peak of his writing career, Graves attempted to unravel the mystery of his creative process. That effort took him on a journey across time and culture through which he envisioned a mythical female muse that he called the White Goddess. Produced and Written by David O'Dell and Betsy Bayha. In France's darkest hours of World War II, a lone French voice emanated from BBC radio in an attempt to rally free French forces to resist the power of invading Germany. Recognizing his value as an ally, Winston Churchill acknowledged de Gaulle as the French leader despite the fact that a national government still existed in France. As he was forced to the sidelines of Allied Command decisions, de Gaulle led military campaigns defending France's colonies, building his reputation. Despite this, he was excluded from Normandy operations. He nonetheless accompanied US forces with great theatricality as they arrived in Paris, and was soon elected head of the French government. Years after his retirement, the French people turned to de Gaulle for guidance during the Algerian crisis, but his mythic position as the face of France would end during the social upheaval of the 1960s. Produced and Written by Karena O'Riordan. Below are current event articles that relate to events, topics, and people found in Trenches of Hell. It is believed that John McCrae wrote the famous poem ‘In Flanders Fields’ during the evening of May 3rd 1915 – after carrying out a funeral service for a friend during the Second Battle of Ypres. John McCrae was a Canadian doctor, and is reported to have written the poem while sitting in the back of an ambulance near a battlefield casualty station just north of Ypres. Two enemy soldiers face each other, arms outstretched and about to shake hands. This touching new statue captures one of the most incredible and moving moments in the history of warfare. It was carved in memory of the Christmas Day truce of 1914 when British and German soldiers left their trenches and put their bloody conflict to one side to enjoy a spontaneous football match in no-man’s land. Nearly a century after they died in battle, the remains of unidentified Canadian soldiers who fought in the First World War are still being found in Europe. Today the Department of National Defence released the names of four who died during the Battle of Amiens in August 1918. Their resting place was discovered in 2006 by then 14-year-old Fabien Demeusere, while digging in his back garden in Hallu, France, 120 kilometres north of Paris. History remembers trench warfare as wasteful, futile, and uninspired, but in reality it was a deeply thought-out system that underwent constant revision. Here's how it worked during World War I. Top image: A painting by Captain Kenneth Keith Forbes shows a Canadian 6-inch howitzer supporting British troops in the attack on Thiepval on 16 July 1916 during the Somme offensive. Via Canadian Artillery in Action. It was around this time 100 years ago that the mobile battlefield along the Western Front ground to a screeching halt — a 440 mile stretch that barely moved in the ensuing four years. During World War I, No Man’s Land was both an actual and a metaphorical space. It separated the front lines of the opposing armies and was perhaps the only location where enemy troops could meet without hostility. It was in No Man's Land that the spontaneous Christmas truce of December 1914 took place and where opposing troops might unofficially agree to safely remove their wounded comrades, or even sunbathe on the first days of spring. Everyone knows about the horrors of life in the trenches of the First World War, but it’s only recently that the anxieties of people back home in Britain have started to be talked about. At long last, those feelings are being aired more widely, thanks to a new anthology of letters written, at the time, to The Daily Telegraph. The message these missives impart is of a nation that was desperate to provide support, of any kind, to our brave boys fighting on just the other side of the Channel. The United States had entered the war with high hopes and dreams—aiming to make the world “safe for democracy” as President Woodrow Wilson would proclaim, but by the 1920s there were strong feelings that the U.S. should never have gotten itself involved in the byzantine affairs of the European powers. Isolationist sentiments grew across the country especially after the rejection of the Versailles Treaty by the U.S. Congress in 1920. These feelings of bitterness and disappointment found their fullest expression in the literature of the day, written by members of what has become known as the “Lost Generation,” most notably John Dos Passos, William Faulkner, F. Scott Fitzgerald and Ernest Hemingway.